Finally, my semester is over, holidays are over, New Year's is over, and I can knit and crochet again - yeeey. Although I do have art exhibitions coming up (yes I paint, draw, make sculptures too). I love to make hats, and booties, and socks, and little gloves, and you name it, for newborns. I really like to make stuff for them. The are so cute, and precious, and cuddly that it is easy to think of some outfit to knit or crochet for them. A little bit of lovely yarn, one or two hours of free time, imagination, and you have a beautiful present. This time I was inspired by a bonnet I saw on the internet. It was just a simple, minimalistic crocheted hat, and I decided to make similar, but with a lacy feel to it. 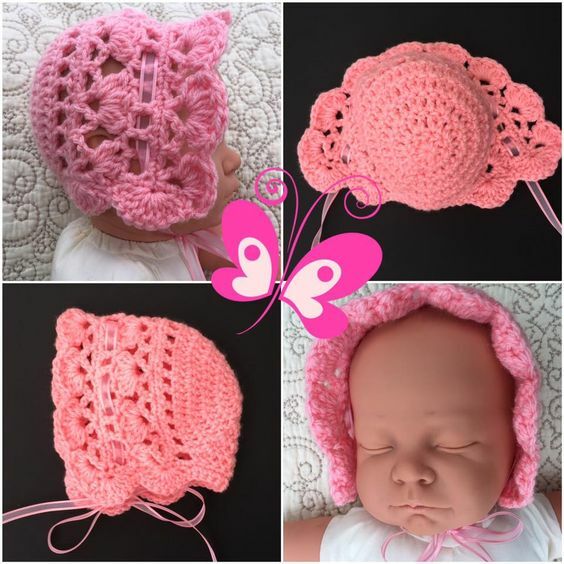 I had an idea how this bonnet should look like. I found an elegant, repetitive pattern in one of my books, counted my stitches and "went to work." I chose one of my pink yarns - about 1/2 ball of a leftover from some project I did a while back. I decided to crochet this hat as I was videotaping making it. 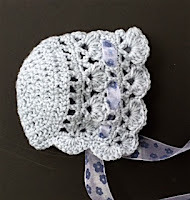 This hat/bonnet crochets relatively fast. It has only 15 rows. Therefore it is quite an easy project. You need to know only basic stitches. There is a video on my YouTube channel for Right-handed and Left-handed crocheters, too. The video is very detailed, so if you think you can't do it - I think yes you can. Just follow me along the video, slow it down (I made a video how to slow it down - click HERE) or rewind and rewatch. Enjoy. 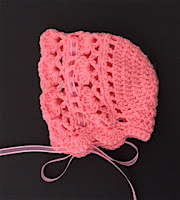 First, make "Base Part" (back of the hat) in the round (5 rows); then continue with "Lacy Part" back and forth (8 rows). Finish crocheting around the "Sides and the Nape Area." First make "Base Part" (back of the hat) in the round (5 rows); then continue with "Lacy Part" back and forth (8 rows). Finish crocheting around the "Sides and the Nape Area". 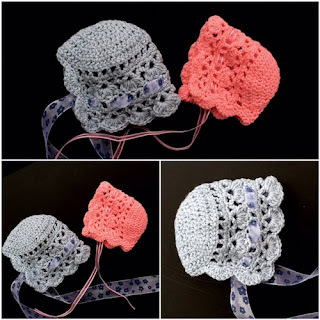 There is a video in my YouTube channel for Right-handed and Left-handed crocheters. We will work in rows, start counting your rows from "1". Row 4 ch3, into first "V" make [cluster A, ch1, cluster B, ch1]; into next 6 consecutive "V"s work as such: *[cluster B, ch1, cluster B, ch1, cluster B, ch1]* - repeat this sequence from * to * 6x; finish with cluster B, ch1, cluster B in the last (8th) "V"
Row 8 into first "V" make [cluster A, ch1, cluster B, ch1, cluster B, ch1]; into next 6 consecutive "V"s work as such: *[cluster B, ch1, cluster B, ch1, cluster B, ch1, cluster B, ch1]* - repeat this sequence from * to * 6x; finish with cluster B, ch1, cluster B, ch1, cluster B in the last (8th) "V"
We will continue crocheting a border along the neck area. Hold your bonnet as if to continue around. Row 2 *[skip 2 sts, into 3rd sts crochet 7 dc, skip 2, into third st make 1 sc]* - 2x, then 1 sc in next 10 consecutive sts, skip 2 sts, into 3rd sts crochet 7 dc, skip 2, into third st make 1 sc, skip 2 sts, into 3rd sts crochet 7 dc, skip 2, into third st make sl st, then make a knot and weave in all the ends.